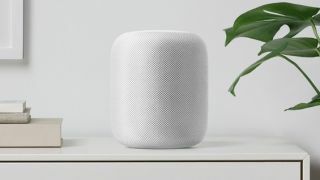 Apple has confirmed that you won’t be able to stream music to the HomePod speaker from a phone or tablet using Bluetooth. One of the big questions that is currently hanging over the smart speaker is whether you’ll be able to play music from third-party music providers like Spotify. Apple is famous for its closed ecosystem, and it looks like the HomePod is no exception. Along with native audio content from Apple Music, iTunes, Beats 1 Live Radio, and podcasts, you’ll be able to stream music to the speaker, but only over AirPlay, meaning you have to be the proud owner of an iPhone, iPad, iPod touch, Apple TV or Mac in order to stream music to the HomePod. This is perhaps no surprise, seeing as you need a device running iOS 11 to set up the speaker in the first place, and we imagine that those willing to invest in the expensive speaker will already be the type of person who has all the latest Apple goodies anyway. Apple isn’t explicit about what you’ll be able to stream over AirPlay, just saying “other content”. As you can already stream Spotify over AirPlay, this would seem like a workaround to get it (and other music services like it) on to the smart speaker. Whether you’ll be able to use Siri to control Spotify over AirPlay is another matter entirely, and we’ll have to wait until the HomePod’s release on February 9 to test it out. The HomePod’s biggest competitors the Amazon Echo and the Google Home both have third-party streaming natively on the speaker, even if they try to favor the native Amazon Music and Google Play alternatives. As HomePod is angling to be the smart speaker that excels at music, having limited access to one of the most successful music streaming services in the world is certainly an interesting move.